By 1838 it was clear that transportation to the Colony of New South Wales would soon end. A Commission of Inquiry chaired by a British opponent of transportation, William Molesworth, was investigating the convict system and assignment of convicts to private settlers was winding down. The transportation of convicts to New South Wales was suspended in 1840, and assignment of convicts to private settlers formally ended in 1841. By then no more than 10 convicts were working at Tocal, compared to 33 ten years earlier. 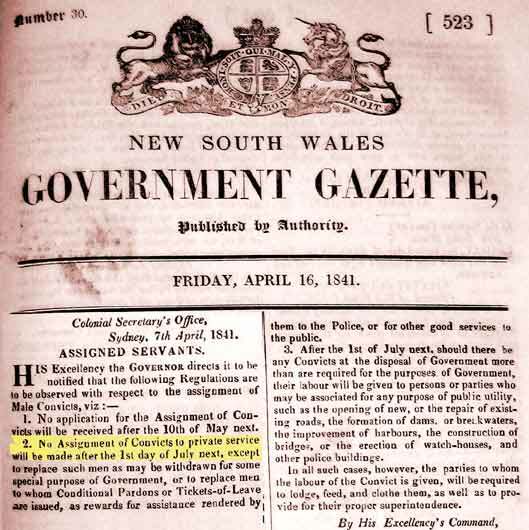 Below: NSW Government Gazette announcing the end of convict assignment to settlers. Tocal now had to rely on the employment of free immigrants, ex-convicts and people born in the Colony. In 1845 the lessee of Tocal, Charles Reynolds, imported workers directly from England to fill the gap. In two decades convicts had developed Tocal from rainforest and bushland into a productive and valuable estate, but the days of the lash, the treadmill and the iron gang were over. 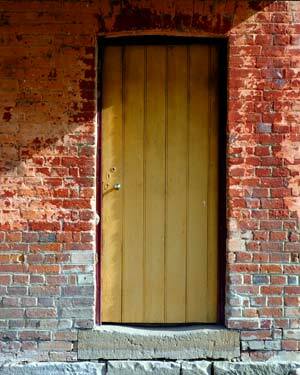 Right: One of the entrance doors to Tocal's convict barracks. Note the flagstone worn by the footsteps of convicts, ex-convicts and free workers during the 170 years of the building's use.